straight stitches. Shown mounted in 5” hoop. I stained the hoop with an antique pine wood stain as I rather liked the effect of the darker wood against the blue linen background fabric. Pattern includes full size design (right way round and reversed to suit your preferred method of transfer), DMC floss requirements and full stitching instructions. 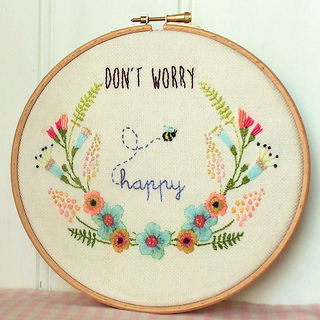 Please note, listing is for the pattern to stitch your own hoop and not the finished item. This is a digital pattern and you will not receive anything in the post. A download link will be emailed to you once your order is complete, and your pattern will also be available to download in your account.